We have covered the Digital Picture Frames with a built-in printer before, such as the Keian Japan P71-A2-AP. It would appear that Amex Digital is getting on this digital frame/printer bandwagon with the SP-7. 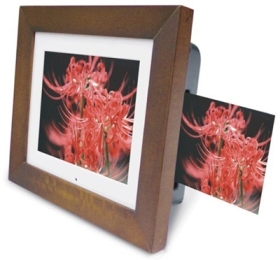 What makes the Amex Digital SP-7 different from other digital picture frames isn’t just the printer, but it is made of Acrylic/Wood. It also has a seven-inch 16:9 TFT color LCD display with 800 x 480 resolution. You can download your pictures to the frame via USB, and you can also use the MS/MMC/SD, XD/CF card reader. The user has the option of making a slide show. There is also the option of music and video playback, all of which is accessible with the included remote control. The user can adjust the volume on built-in speakers, and the brightness on the picture. I suppose this is just the beginning of products such as this, and we will definitely be seeing more digital picture frame printers in the future. That way, if you have guests over, and they like what they see in the frame, you can just print out a print for them to take home. If you would like to get in on this new trend, then you should be able to purchase the Amex Digital SP-7 for about $199.